Ergonomics is the science, and practice, of combining the work environment, job tasks, equipment, and people so that performance is enhanced and risk of injury is reduced. There are eight ergonomic risk factors in industrial/office work, as well in a personal training setting. Ergonomic injuries cause pain, disability, emotional stress, and reduced productivity (Ayoub, 1990). Properly designed work-stations can prevent ergonomic injuries in a personal training setting. Ergonomics is an important variable for personal trainers to consider when performing their day-to-day job tasks and in designing their work-stations (the gym). Review the eight ergonomic risk factors as they relate to personal training. 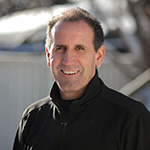 Understand how ergonomics is important in exercise and with exercise equipment. Relate ergonomics to personal training job tasks for performance enhancement and injury prevention. There are specific ergonomic issues that can enhance performance and reduce the risk of injury. Many trainers have heard of ergonomics as it relates to office work-stations or in an industrial setting. Common ergonomic practices such as correct computer work-station design and proper lifting techniques are important ergonomic considerations. However, some trainers may take for granted the ergonomics of their work. Reducing injuries and improving performance can have big payoffs relating to continued wage earnings, ability to work, job satisfaction, and health care costs. The exercise equipment industry was one of the first to recognize the importance of ergonomics relating to making machines adjustable for different size persons. Exercise/spin bikes are a classic example of ergonomic designs. The seat and handlebars move up and down, forward, and back. The pedals have toe straps to allow a push and pull of the leg. Ergonomics is important in the design of display consoles making it easy read, recognize, and push the control buttons. Ellpitical trainers, treadmills, rowing machines, and home weight training gyms all have specific and specialized ergonomic features that enhance the comfort of a work-out and can enhance exercise retention. When rating exercise equipment for purchase, the ergonomic design plays an important role (Bracko, 2004). The practice of ergonomics takes into consideration the application of science to the design of work-stations for enhancement of performance and productivity, and the prevention of injuries. Keyserling (1995) indicates the goals of an ergonomics program includes: design work stations to be compatible with human limitations & prevent excessive fatigue and discomfort, prevent musculoskeletal disorders, create a safe work environment and prevent accidents, and improve production. Keyslerling (1995) and Fine and Silverstein (1995) identify the eight ergonomic risk factors as follows: poor posture, repetitive/repeated work, high muscle force, excessive static muscle work, "mechanical" pressure on body part, poor environment, excessive vibration, and behavioral. For personal trainers, the ergonomic risk factors include: repeated lifting/trunk flexion, improper lifting technique, voice fatigue, slips, trips, and falls, burn out from teaching too much, poor hydration and nutrition through the day, and stress of clients, co-workers, and supervisor. Poor posture relates to standing, sitting, and/or unusual body positions when teaching and doing office work. Repeated trunk flexion, flexing the spine instead of bending or hinging from the pelvis (Osteoporosis Canada, 2016) can cause pain or injury. An example of repeated trunk flexion for a personal trainer is picking up a water bottle from the floor. The ergonomic solution is not to put the bottle on the floor rather, on a chair or higher. However, in some exercise settings this is not possible. Therefore, proper lifting technique is important. Flexing the spine when lifting puts excess pressure on the intervertebral discs. When done repeatedly it can weaken the posterior of the disc putting it at risk of herniating. Therefore, it is important to bend/hinge from the pelvis maintaining the natural curves in the spine. "Bending with a Neutral Spine" (n.d.). Another lifting technique for light objects is to use a Golfers Lift where you are balanced on one leg, and picking up the object like a golfer picks up his ball from the hole maintaining a neutral spine. These two lifting techniques are important considering a trainer may pick up his/her water bottle 50 times a day. Of course, proper lifting techniques are important when lifting heavier objects as some trainers “forget” to lift safely when they are in the high energy of a session. Most back injuries are caused by repeated strain. Repetitive movements (most commonly trunk flexion) of the spine result in micro-traumas to the disc(s) which can lead to a macro-trauma of a herniated disc or muscle strain (McGill, 2001). Poor posture while sitting is another important consideration. While working on a computer, the general rule is to be seated so that the ankles, knees, hips, and elbows are approximately 90 – 100 degrees, in an ergonomically sound chair. It is recommended there be a 50-minute sitting limit, after which we should stand and engage in movement or stretching (McGill, 2001). Professional voice users include broadcasters, actors, singers, ministers, auctioneers, teachers, and personal trainers (American Academy of Otolaryngology). Vilkman (2004) indicates a well-functioning voice is an essential tool for one third of the labor force. Demands on the voice vary between professions. In professions with heavy voice demands occupational voice disorders are common. Environmental risk factors for voice strain include: voice use without time for voice rest, speaking/teaching with high background noise, poor room acoustics, poor indoor air quality, poor posture, and lack of voice amplifiers (Vilkman, 2004). Hydration is important to maintain a healthy voice. Theoretical and clinical evidence suggest that increasing systemic and superficial hydration may benefit voice production (Sivasankar and Leydon, 2010). Projecting the voice is not done by, or through, the throat. The throat is a channel for sound. The power of voice comes from the lungs, diaphragm, and intercostal muscles. Posture is important as is abdominal contraction to project the voice from the diaphragm and not the throat. Risks exist from tripping hazards when weights are not returned to racks or members bring coats or workout bags to the gym floor instead of putting them in lockers. Trainers can ensure a safe work place by checking the floor for tripping hazards before each session. If a gym does not have lockers, it is prudent to make a specific space for personal belongings so as not to have them in the work area. A poor environment can be any of the following: too hot, too humid, too cold, poor air quality, unpleasant odor, poor ventilation, or the smell of sweat in a gym. Behavioral or psychological factors at work that can cause injuries include personal issues, taking on too many clients, not enough clients, problems with other trainers, and poor relationships with supervisors. Stress can cause aches and pains, or injury, by altering muscle tension or the perception of pain. Stress may also be important in determining if an ache and pain develops into an injury. Psychological factors have been found to be of significance in predicting back, neck, and shoulder pain (Bigos et al., 1992). Clients can also cause stress by being very demanding. It is important to make time to take nutrition breaks through the day or evening. Allowing at least fifteen to thirty minutes to eat gives the mind and body a chance to rest, recover, and replenish nutrients needed for the demanding work. Equally important is preparing food to eat during the day. Preparing lunch and snacks the night before or in the morning before work is important. Hydration is equally important, but probably not as big of an issue because it is easier to drink than it is to eat. 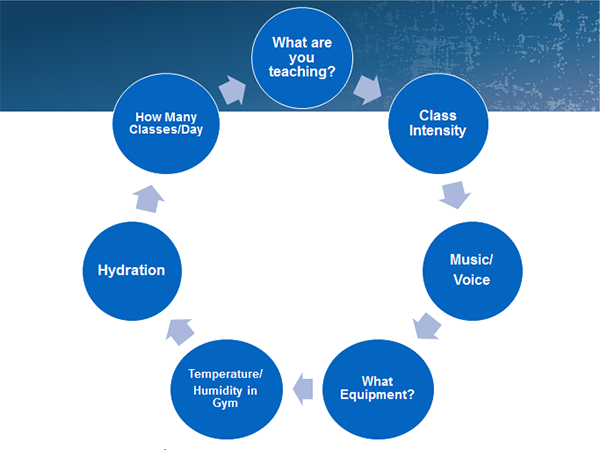 Hydration is important because of the sweat lost during workouts, but also because trainers are talking a lot and fluid is lost by using the voice. So many personal trainers are self-employed it is important to pay attention to injury prevention. Paying attention to the ergonomics of the gym can pay off big time by preventing injury and improving work enjoyment. Lifting with a neutral spine is always important. Projecting the voice from the diaphragm can reduce voice strain. Removing all tripping hazards can eliminate slips, trips, and falls. Maintaining good air quality, temperature, and humidity are important for a good work environment. Behavioral or psychological factors sometimes cannot be avoided, but trying to work through difficult situations can prevent stress related aches and pains. Personal trainers must pay attention to maintaining a good quality and quantity of nutrients during the day/evening as well as staying hydrated. "Special Care for Voice Users." Entnet.org. American Academy of Otolaryngology-Head and Neck Surgery, 2015. Web. 24 Oct. 2016. Ayoub. M. (1990). Ergonomic deficiencies: Pain at work. J Occup Med, 32(1), 52-57. Bigos, S. et al., (1992). A longitudinal, prospective study of industrial back injury reporting. Clin Orthop Relat Res, 279, 21-34. Bracko, M. R., (2004). Gearing up for home fitness, Consumers Digest, January/February. Fine, L. and Silverstein, B. (1995). Work-related disorders of the neck and upper extremity. Ed: Levy, B.S. & Wegman, D.H. Occupational Health: Recognizing and Preventing Work-Related Disease. Little, Brown and Company, Boston. Keyserling, W. (1995). Occupational ergonomics: Promoting safety and health through work design. Ed: Levy, B.S. & Wegman, D.H. Occupational Health: Recognizing and Preventing Work-Related Disease. Little, Brown and Company, Boston. McGill, S. (2001). 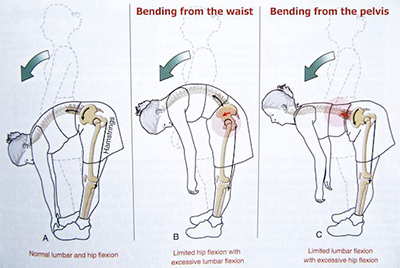 Low back stability: From formal description to issues for performance and rehabilitation. ‎Exerc. Sport Sci. Rev, 29(1), 26-31. "Bending with a Neutral Spine." Osteoporosis Canada. Osteoporosis Canada, n.d. Web. 26 Oct. 2016. Sivasankar, M. and Leydon, C. (2010). The role of hydration in vocal fold physiology, Curr Opin Otolaryngol Head Neck Surg, 18(3), 171–175. The Ergonomics Society Web Site: www.ergonomics.org.uk, Retrieved October 26, 2016. Videman, T., Nurminen, M. and Troup, J. (1990). Lumbar spinal pathology in cadaveric material in relation to history of back pain, occupation and physical loading, Spine, 15, 728-740.